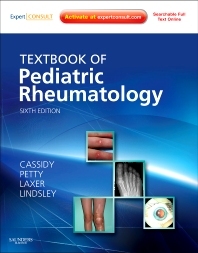 Textbook of Pediatric Rheumatology examines the full spectrum of rheumatologic diseases and non-rheumatologic musculoskeletal disorders in children and adolescents, detailing the presentation, differential diagnosis, course, management, and prognosis of every major condition. Drs. James T. Cassidy, Ross E. Petty, Ronald M. Laxer, and Carol B. Lindsley discuss recent developments in diagnosis, treatment, genetics, immunology, imaging, and more. This new edition features access to the fully searchable text online at www.expertconsult.com, where you’ll find a downloadable image gallery and exclusive web-only content for added value. Apply the knowledge and experience of the leading experts in the field.